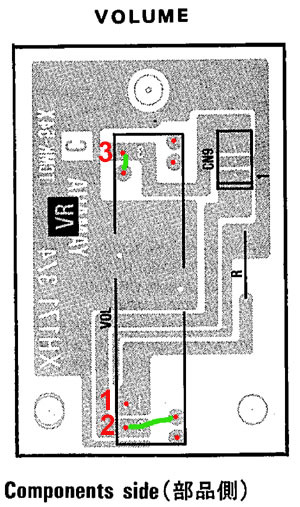 To use part #3033 as the Volume slider in a Yamaha SY22 or SY35, you will need to jumper the pins as shown in green in the diagram at left. You can do this either by soldering wires between these pins, or by simply bending the pins over and soldering them together. The diagram shows the volume board as shown from the top side - in other words as looking down onto the top of the slide potentiometer.